Some people might look at a recipe for risotto on this blog and rage at me, “This is not simple food! 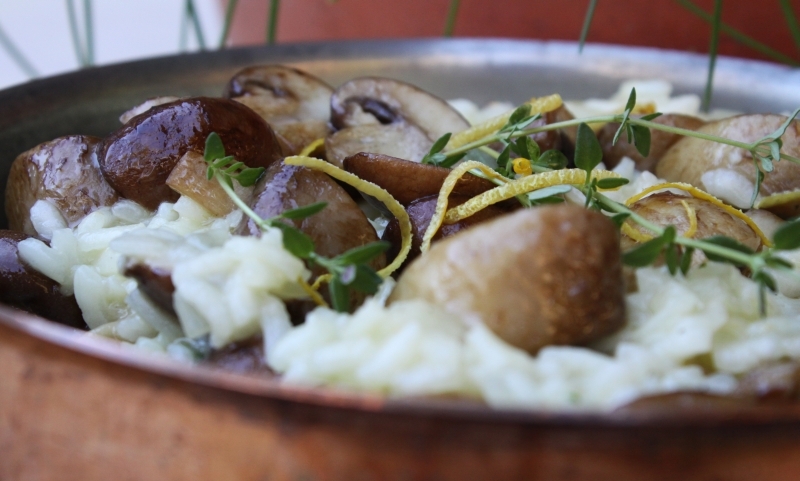 Risotto is complicated” But, at the heart of the matter, risotto is a simple dish – rice, stock, flavourings and love. People get all caught up is how to make the perfect risotto and end up not cooking this fabulous family dish that is delicious and also quite economical. My only non-negotiables in the making of risotto are to make sure the rice is well coated with the olive oil before adding the stock, and to always, but always, add some butter just before serving to accentuate the creamy texture. Put on some jazz and stir away while drinking a pre-dinner glass of white wine. You’ll feel great and your family will love the end result. In a large pan heat 1 tablespoon olive oil and add the onion, garlic and celery. Saute until the onion becomes transparent, about 3-4 minutes. Add the rice and stir for another couple of minutes until the rice is shiny and well coated with the olive oil. Add the stock gradually, a ladleful at a time, stirring frequently and adding more stock as all the liquid gets absorbed by the rice. Meanwhile, in a non stick pan over high heat, cook the mushrooms with the remaining oil and a couple of sprigs of thyme until golden. Season well with salt and pepper and set aside. After about 15 minutes the risotto should be almost ready and all the stock used. It needs to have just a little bite left and be a bit soupy in consistency. Turn off the heat, and stir through the butter, parmesan and parsley. Cover tightly and let sit for a couple of minutes. Call the family to the table and then just before serving stir through the mushrooms and adjust the seasoning, if necessary. 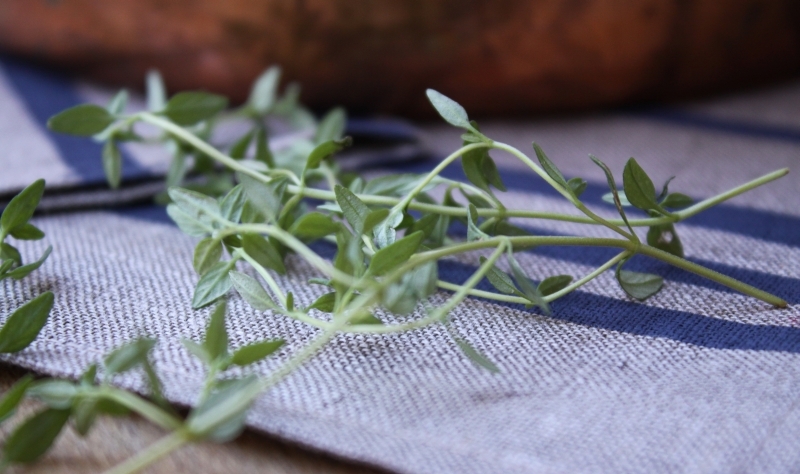 When serving, scatter a little lemon rind and the remaining thyme over each serve. 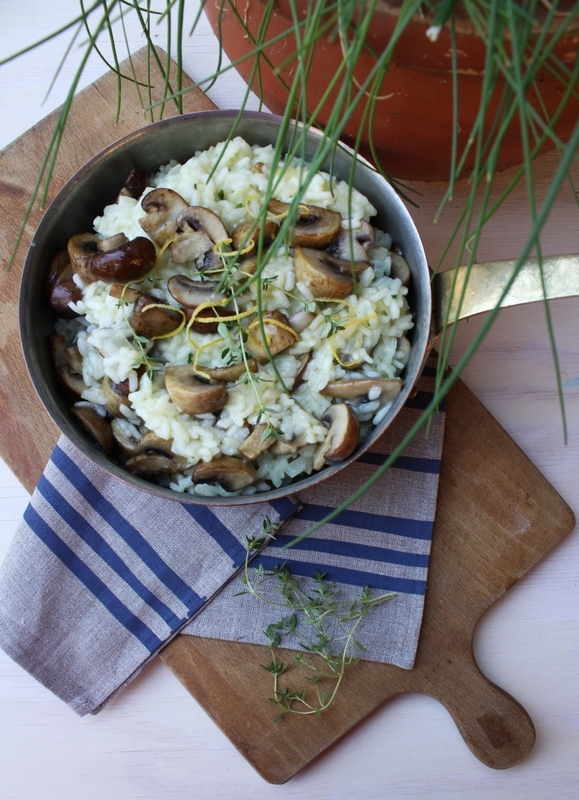 This risotto is great with a good white wine – perhaps a Riesling. Looks delicious! It may require many ingredients, but it’s worth the time and effort 😀 Thanks for sharing!